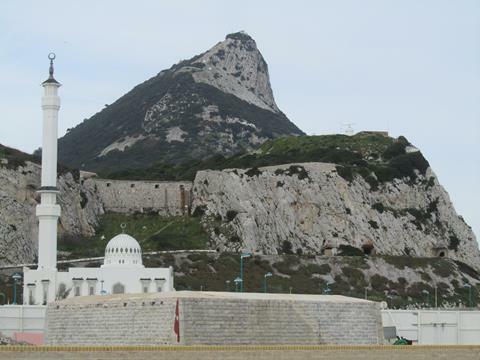 Gibraltar is a small slice of Britain on the southern tip of Spain, a fortified rock that has been British	for longer than America has been American. Its economy is mainly based around banking, shipping	and tourism, and it has to be self-sufficient in electricity and water, as cooperation with Spain	is not always guaranteed. 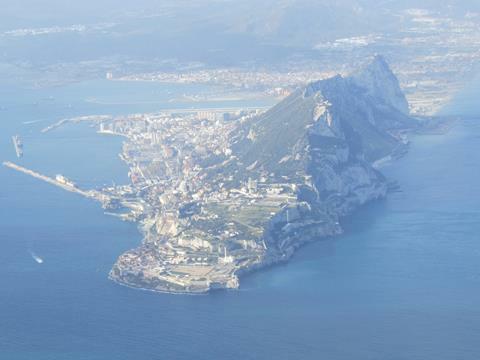 Both the British and the Spanish accuse each other of hypocrisy when dealing	with the possibility of returning Gibraltar to Spain or Ceuta and Melilla to Morocco. I went to Gibraltar at the start and the end of my time working in Cadiz in early 2013, first for a day trip and then as my departure point to fly back home to Aberdeen. I was really pleased to have	the chance to visit, having been denied ten years earlier on my way back to Valencia, after awful food poisoning contracted in Morocco. Even on my January visit the temperature was mild and it was an easy place to explore. 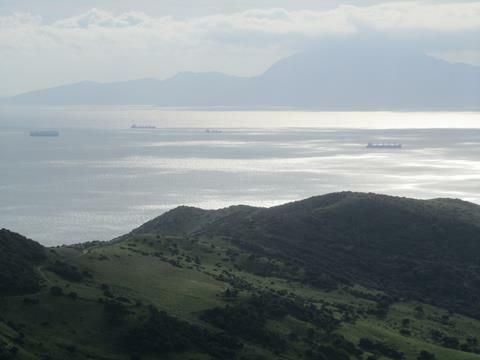 Looking across the Straits of Gibraltar from Europe to Africa. At the end of the last ice age, this	area may have been the site of the world's largest waterfall, as the Atlantic Ocean brimmed over and	filled the Mediterranean. Now it is one of the world's busiest shipping lanes. At its narrowest,	there are only nine miles of water separating the two continents. The Rock of Gibraltar itself, one of the two Pillars of Hercules, guarding the entrance to the Mediterranean	Sea. This is the view from La Linea, the town on the Spanish side, where I parked my car and	started walking towards the border. After you flash your British passport at the border guard and waltz over the runway, this sculpture	welcomes you to the Cradle of History. 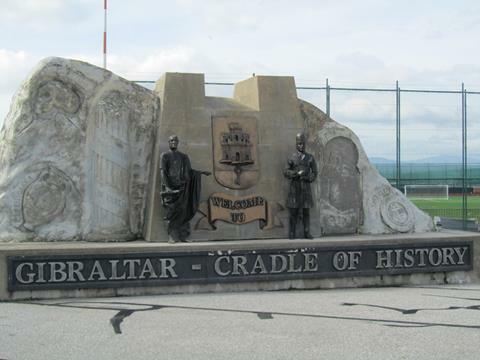 Gibraltar, or "Gib" for those in the know, has changed hands	a number of times over the centuries. 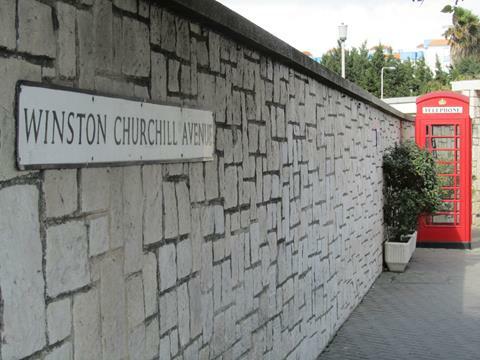 Immediate reminders of Britain pop up as soon as you are in to Gibraltar - what could be more British	than a London phone box on Winston Churchill Avenue? 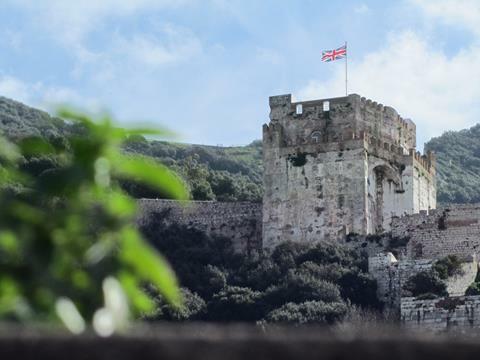 The Union Jack flies from the Moorish Castle at the city walls. The Tower of Homage seen here was built	in the 14th century, towards the end of the Moorish Occupation, when much of Spain was Islamic for	over seven hundred years. 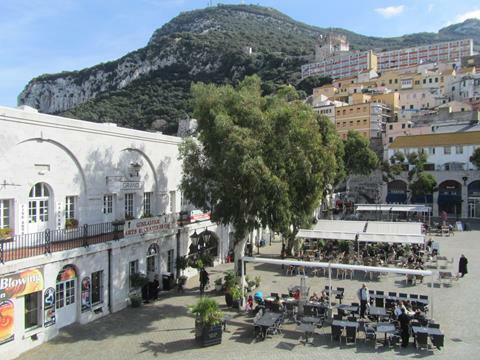 Casemates Square is the first stop for many arrivals on foot, nestled just within the fortified walls. I had fish and chips in one of the cafes - lovely. 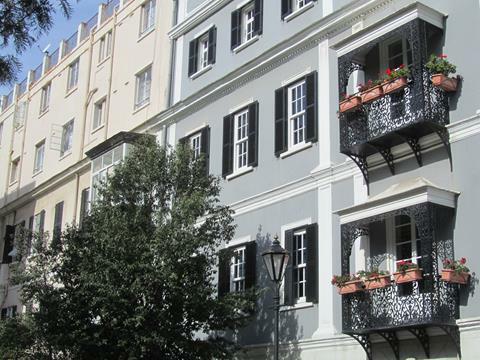 Whilst British in territory, there is much European style influence in the architecture, with pretty	street facades like this around town. 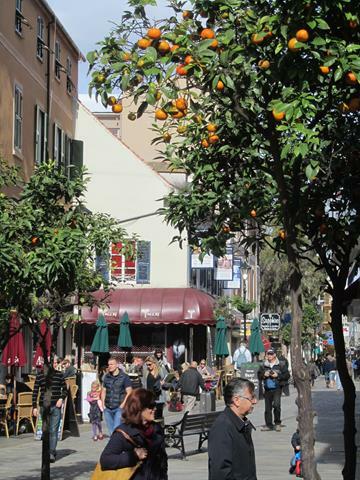 Gibraltar's Main Street features many British high street staples like Marks and Spencer, but orange	trees are perhaps less common in York or Edinburgh than here. 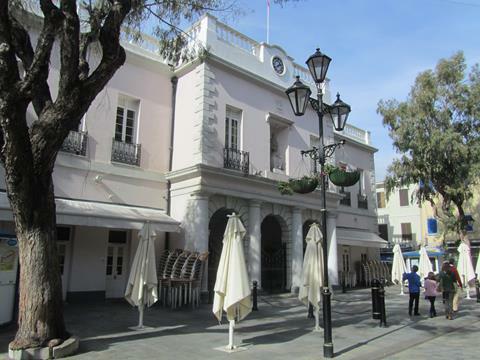 Gibraltar's Parliament building is in the centre of town, on John Mackintosh Square. The present building	was built in 1817, and there are seventeen seats for elected members. 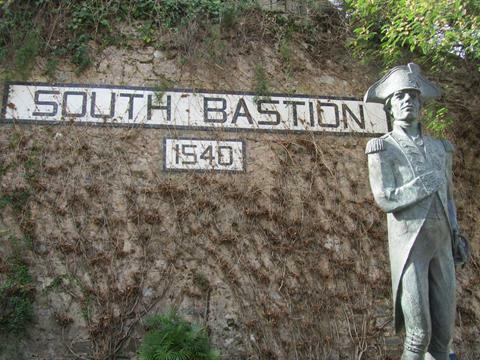 South Bastion, one of the old city walls, and a statue of Lord Nelson keeping watchful guard. Nearby	are the Southport Gates. 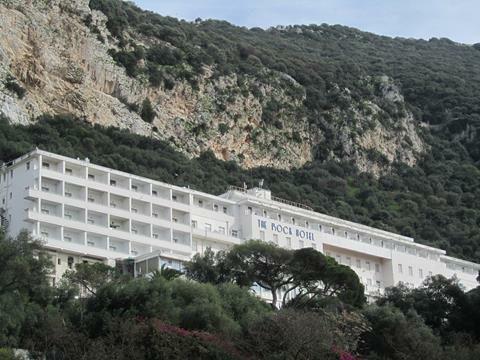 The Rock Hotel sits part of the way up the rock itself, underneath the cable cars wending their way	skyward. It is a gleaming white art-deco building, one of the most famous in the territory. 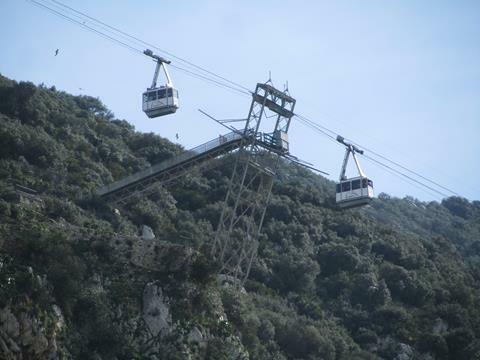 The Gibraltar Cable Car runs to the top of the rock, although on my visit it shut down just after I	took this photo when I tried to buy a ticket, due to high winds. So instead I booked a tour of the rock	in a little minibus, which got me up there too. On the southern tip of Gibraltar at Europa Point is the Ibrahim-al-Ibrahim mosque, built in the modern	Gulf-style with Saudi funding in 1997. 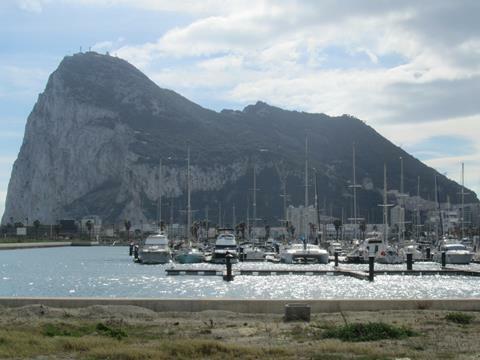 The Rock of Gibraltar is pretty solid, but not exclusively so. 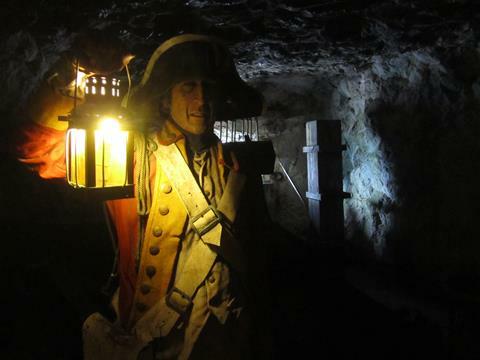 There are many natural caves, but also	siege tunnels such as these on the north face, built for resistance against the Spanish and French siege of the late 1700s. It is possible to walk quite some distance through the tunnels today. 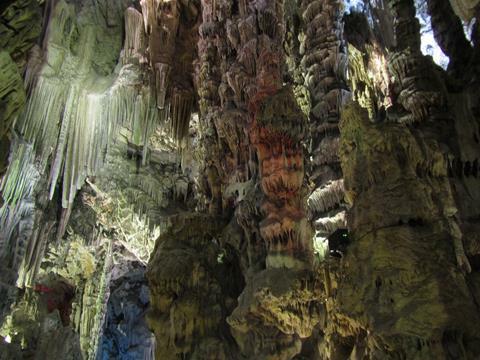 St Michael's Cave is one of the largest and certainly the most visited cave in Gibraltar. There is documented	evidence of its use going back over two thousand years. 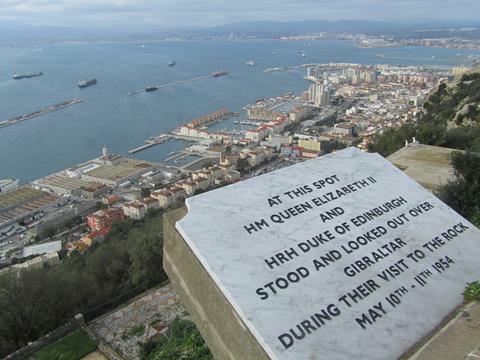 At the top of the rock there are clear views all across the bay of Gibraltar, around to Algeciras and	over to Africa. On this particular spot, our new Queen and the Duke of Edinburgh took in the view in 1953. 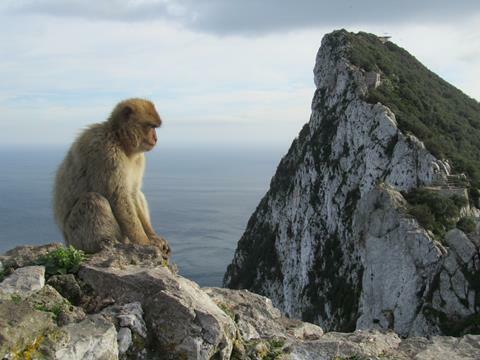 Gibraltar is famously populated by a colony of barbary apes, mostly found in the higher regions of the	rock. Although popular with tourists, they are wild and not to be tangled with. Legend has it that	the British will leave only when the apes do. 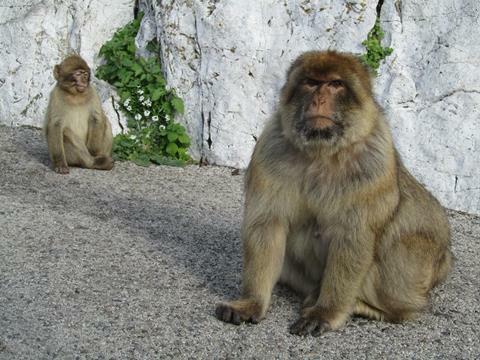 A mama barbary ape guards her baby with a no-nonsense gaze towards me. I got the message. 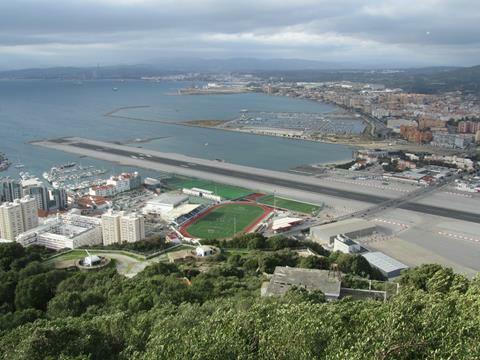 Gibraltar's airport is squeezed in to the narrow strip of flat land between the rock and the border	with La Linea. This makes it within conveniently easy walking distance of much of the town, and a spectacular	take-off and landing for passengers. 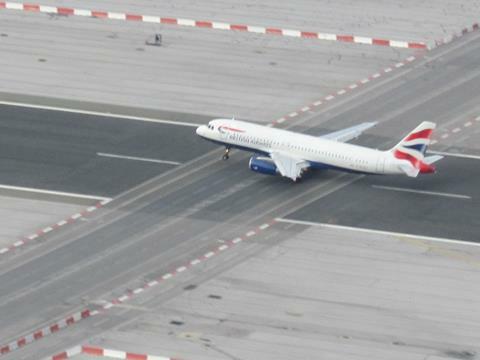 One of the quirks of the airport is that the main access road in and out of Gibraltar crosses right	over the middle of the runway. 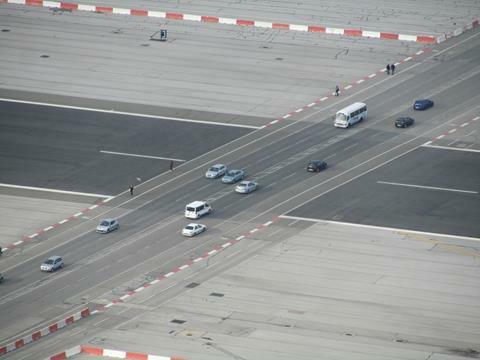 This was how I walked in and out on both of my visits, and traffic is	stopped periodically for aircraft movements. There aren't many flights from Gibraltar airport, and the regular ones just go to London and Manchester. There has been much talk of a tunnel to bypass the runway, but as of 2015 it had failed to materialise. The whole of Gibraltar as seen from the air, on my flight back to Britain. Tally-ho!